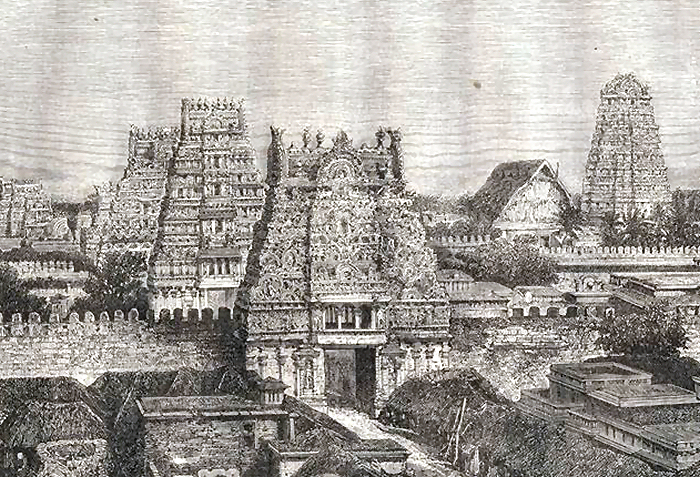 Renganatha temple at Srirangam witnessed significant changes under the patronage of the Pandyas of the Second Empire both in administration and as well in appearance. 67 inscriptions of them engraved at the temple between C. E. 1225 and 1344 provide interesting details on various aspects of the temple management and the enormous gifts showered on the deities. 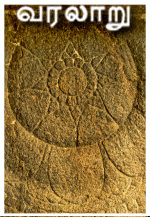 Though the rule of the Hoysala kings overlapped during this period and their inscriptions are also found at Srirangam, this article focuses exclusively on the Pandya role at this temple complex, that too of the two Sundara Pandyas, Maravarman I and Jatavarman I. The Pandya resurgence in Tamilnadu was caused by the repeated expeditions of Maravarman Sundara Pandya I who defeated Chola king Rajaraja III and established his authority in this part of the country. 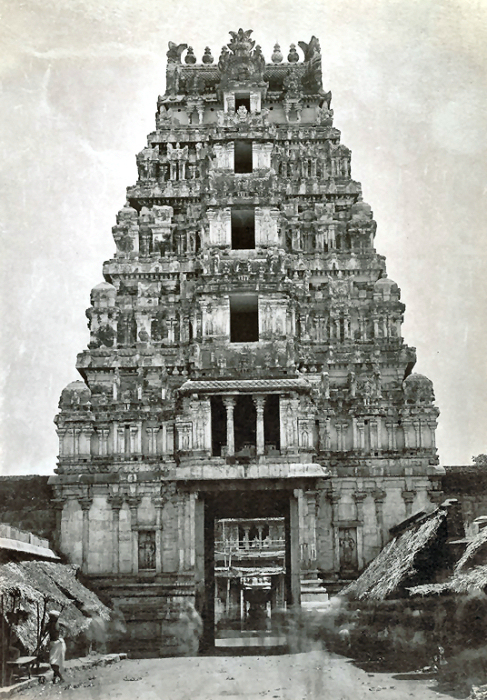 His record dated on the 28th of March 1225 C. E. copied from the Renganatha temple at Srirangam highlights the changes that were made in the administration to weed out the miscreants. This was the first time in the history of the temple a massive gathering was called in order to enquire into the misdeeds that had occurred in the temple during the skirmishes between the Cholas and the Pandyas. The gathering included the Jiyar, Srikaryam, Bhagavathas, Nambimar of different cadres, Aryan guards of the entrance, Bhattacharyas, members of the assembly of Srirangam and the Srivaishnavas of eighteen mandalas who met on the western part of the Rajamahendran street and streamlined the administration by taking sharp decisions on the appointment of temple managers. It was concluded that those who were deceitful in the past should be kept away from the administration and new persons those who are sincere and dedicated to the cause of the presiding deity and already serving in the temple were to be chosen to look after the high level administrative affairs. It was also decided to make an annual change at all levels of the administrative cadre. Jatavarman Sundara Pandya I who is celebrated in the records as Ponmeynda Perumal is a great warrior and had conquered several kingdoms including Kongu. Renganatha temple experienced maximum patronage in the form of gold plated shrines and vimanas along with massive gifts made out of gold and precious jewels and also witnessed effective administrative changes under his able rule. Three Sanskrit inscriptions engraved in grantha characters enlist the gifts made by him in favour of the temple from out of the gold of the tulabhara ceremony performed by him at the temple. It is also said that the entire valuables offered by him to the temple belonged to the treasures gained by him through his successful expeditions. One of these records presents a vivid description of Jatavarman Sundara Pandya’s building operations at, and gifts to the temple. He built a shrine for Narasimha and another for Vishvaksena, both covered with gold and a gilt tower contained an image of Narasimha. He covered the main vimana of the temple with gold and assumed with reference to it the surname Hemachchahadanaraja (the king who has covered the temple with gold). He installed a golden image of Vishnu inside the shrine which he called after his own new surname. The inner wall of the Srirenga vimana was also covered with gold. The temple kitchen was remodeled, extended and was equipped with golden vessels. A processional festival for the god was celebrated in the month of Chitthirai with great pomp and show. A golden palanquin was added by him for the festival of the god’s sporting with his consort Lakshmi. Sundara Pandya also built three golden domes over the image of Hemachchhadanaraja-Hari, over that of Garuda and over the hall which contained the couch of Vishnu, the Sesha. His miscellaneous gifts to Renganatha included a garland of emeralds, a crown of jewels, golden images of Sesha and Garuda, a pearl garland, ornaments of jewels, a canopy of pearls and different kinds of golden fruits. Chariot, trough, throne, arch, aureole, pedestal, armour, vessels and under garment all made out of gold were also added to the golden treasury of Renganatha temple by him. It is but natural that such prestigious gifts received much appreciation and praise from all quarters of the people attached to the temple. Two records in the form of sonnets one in Tamil and the other in both Sanskrit and Tamil celebrate the king Jatavarman Sundara Pandya highlighting his victories and the unmatched service rendered by him to Lord Renganatha. It adds that it was he who made the temple to glitter with its golden finials and made it a unique abode for the almighty. This sudden enrichment of the temple necessitated administrative reforms and an accentuated protection to safeguard the golden establishments and the jewels. The king sent a royal order to the temple authorities instructing them to change the power of temple management which was vested with one group till then and extend it to members of other groups thereby sharing the responsibilities and also keeping counter check on all the activities of the temple. He also ordered that all the golden establishments were to be guarded jointly by the Aryas and the locals. His order was immediately obliged and a record reveals that as if god Himself had accepted his suggestions and made alternative arrangements to rationalize the administration through His order. A representative committee from all the groups of the temple management was constituted. Two from Kovanavar, two from Srirengamaraiyor, one from Todavattut-tumaraiyor, two from Talaiyiduvar, one from Vasal Aryar and two from Arattamukki anukkar were chosen to the ten member committee to manage the benefactions that enriched the temple. When this order was issued by the god Alagiya Manavala Perumal, He was seated with his consorts in the Bhupalarayan Simhasana at his sacred bedroom. The same tone and pattern which is usually followed in the royal orders is tagged on in the order of Lord Renganatha. As in the case of royal house here also god was briefed as the king by his close associates such as Jiyar and Srikaryam about the activities to be taken. The suggestions made were agreed upon by the god and as in the royal court His verbal acceptance was given a written format by Kannudaiyan Pallavan Vilupparaiyan of Puducheri, the thirumantira olai nayagam of the deity. This peculiar way of executing certain important activities with the formal consent of the god though is met with at a few temples, the procedural formalities followed at Renganatha temple at Srirangam stands distinguished and noteworthy.